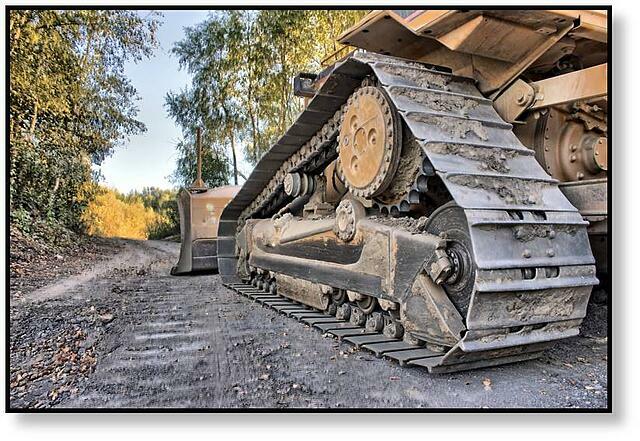 If you look at the tracks on, say, a modern Caterpillar D8 bulldozer, you'll notice that the drive sprocket is set high compared to the older model track loaders. Most compact track loaders and multi-terrain loaders are designed the same way, with the final drive and drive sprocket set significantly above the ground. The tracks then follow a triangular shape (some have described it as scalene triangle) instead of a elongated rectangular shape. 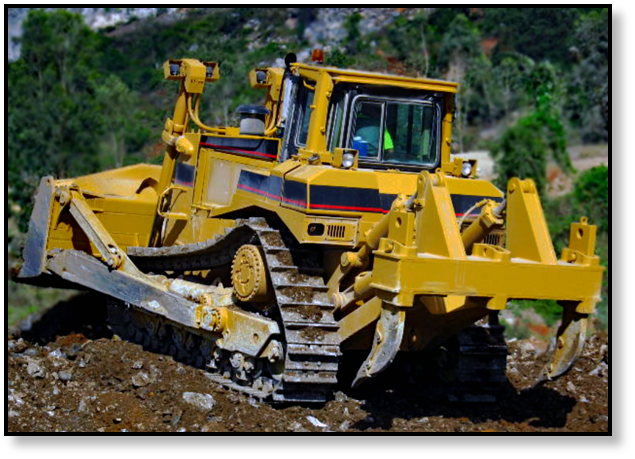 This modern design is easily seen in the photo of the CAT D8R bulldozer shown below, and is often referred to as a "high drive" design. In much older designs of bulldozers and crawler tractors (long before the advent of CTLs and MTLs), the drive train would be mounted rather high in the machine and the cross shaft would exit about where you would see the sprockets in modern CAT bulldozers. 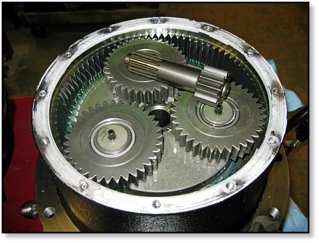 This cross shaft had a pinion gear which would drive a larger gear, mounted below it, to achieve the needed torque multiplication. This would mean that when the bulldozer was pushing a load, all the force necessary to achieve this would be resting on two gear teeth (one on each side). Imagine that for a moment, and think about how heavy duty those gears had to be. In reality, failure of the gears was very common back in the day. Modern Caterpillar dozers, as well as various brands of CTLs and MTLs, opt for the high-drive design, wehre the drive sprocket (and final drive hydraulic motor) is set much higher and results in a triangular track path. Caterpillar actually holds the patent for the high-drive track-type vehicle design, which was assigned to them back in 1974. The image you see below is taken from that patent, and shows the shape of the tracks and the placement of the sprocket quite clearly. The main drawback to this design involves the tracks: by moving the drive sprocket above the ground, the tracks now have one additional place they have to bend. That is going to mean additional wear and tear on the tracks, which can prove very expensive (as most tracked machine owners are all too aware). There must be some major benefit to risking the additional wear on the tracks. When the drive is raised, it is physically separated from the suspension and mounted directly but rotatably on the frame. If it is no longer connected to the suspension, it no longer has to help support the weight of the machine. The suspension will need to be designed to provide the weight support, and the drive system (including the final drive motor (or track motor) and the drive sprocket) can focus entirely on providing the necessary torque to move the dozer or CTL and its load. This design allowed for the development of the final drive motor, a hydraulic motor with an integrated speed-reducing planetary gear system. The design of final drive motors as we know them today solved the problem of placing the entire load on two gear teeth that we talked about earlier. The modern speed-reducing gear system is a planetary gear design, with a ring gear, sun gear, and usually three planetary gears. This distributes the load over multiple gear teeth and places the drive motor up higher, allowing it to be separated from suspension. 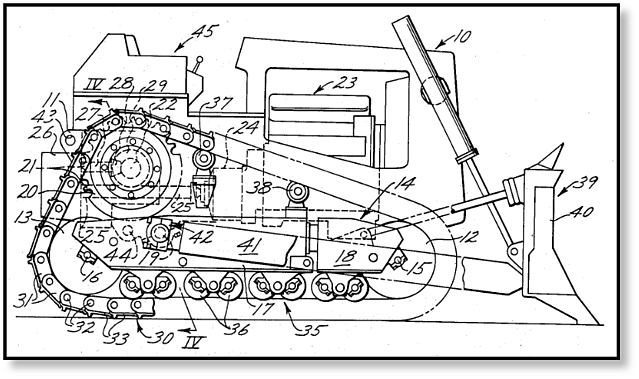 The high drive design for certain tracked vehicles enabled the machines to function more reliably, allowed much greater torque multiplication, and isolated the gearing system from the elements by sealing inside the drive motor hub. It also makes it much easier to access and repair the drive system, including the track drive motor.